Another book coincidence or synchronicity story today but with a twist. I read this first in the Derbyshire Times. 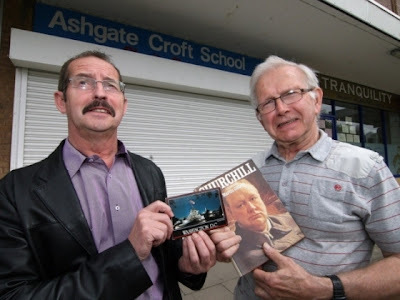 Peter Dodds, 70, lives in Chesterfield, England, and when passing a charity shop he popped in and bought a biography of Winston Churchill for 50p - a bargain! But there was more to this book than meets the eye. As he was glancing through the pages a postcard of Washington DC fell out. You'd most likely think that the previous reader was using the postcard as a book mark or something. But Mr Dodds turned the card over and immediately recognised the address. It belonged to his mother and incredibly the postcard was actually sent by his brother to his mother over 20 years ago - in 1988 to be precise! Mr Dodds, who lives with his wife Lorna told the Derbyshire Times that he, "Half expected Mulder and Scully to turn up. It’s just one of those stories you wouldn’t believe." He phoned his brother, Ian and told him, "I’ve had a postcard from you." Needless to say his brother was somewhat surprised. Mr Dodds added, "It’s so strange because I walk past the charity shop daily and often have a browse at the books. I’d not seen this one before so it must have only just been dropped off. It was as if it was meant to be. I’m not the sort of person who believes in ghostly goings on or anything like that, but it certainly is a strange coincidence." That's a good coincidence! It's also a message from the brother's dead mother. Great synchro! It's also an interesting form of spirit communication! It is an amazing synchro, it's the sort of thing that sounds almost impossible to happen.
" A US man whose home had been foreclosed and was facing eviction just a year after his daughter suddenly passed away has found a lottery ticket worth 4.8 million in his cookie jar "
Quite a story. I see he was a management consultant - doesn't sound too good at his job!